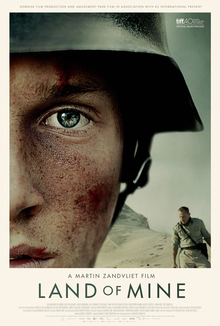 For a relatively small place, Denmark has produced some of the finest films of recent years, and ‘Land of Mine’ is another excellent film to come out of the country. Indeed, this is the 4th year out of 5 that a Danish film has made the Academy nominations list for ‘Best Foreign Language Film‘, with this film following in the footsteps of such great works as ‘A Royal Affair’, ‘The Hunt’, and ‘A War’. ‘Land of Mine’ is slightly weaker than the aforementioned films, however it is still a strong piece of work about the mentality of man in the aftermath of war. Taking place in 1945 shortly after Germany has been defeated in the Second World War, the film focuses on a group of German POWs who are sent to clear land mines from the beaches before they can go home. It’s a film that poses many intriguing moral questions whilst also enveloping many themes of a traditional thriller, by nature of the literal ticking time bombs that run through every scene. Our main focus from the Danish side is through a tough sergeant, Carl (Roland Møller), who we first meet angrily beating on German soldiers who are leaving the country with a Danish flag. He is the sergeant assigned to a group of POWs, all of whom are young, frightened men, barely out of school, and his job is to equip them to the extent they can successfully undertake the dangerous task of removing mines from the beaches. On a simple level, the film is incredibly gripping and tightly wound with suspense each time a soldier starts to attend to a mine, and the audience are fully on edge and aware that something could go wrong at any time (and it often does). It’s more interesting when it explores the bigger questions posed by the situation, and through the character of Carl, we see a complex man with a lot of hate for the people who occupied his country, but also a man who feels some kind of duty of care to the men under his command. Roland Møller is a commanding screen presence, often genuinely frightening but with enough skill to show an air of vulnerability under the tough exterior. He’s hard to like but we can understand why he feels the way he does, and why he plays the role he does. ‘Land of Mine’ is a hard hitting film about a WWII event that I wasn’t previously aware off, and it’s often a difficult watch with gruesome bloodshed and a premise where the characters are constantly in peril. Like many of the great works of Danish cinema in recent years, it tackles a difficult situation with intelligence and nuance, and I highly recommend checking it out.